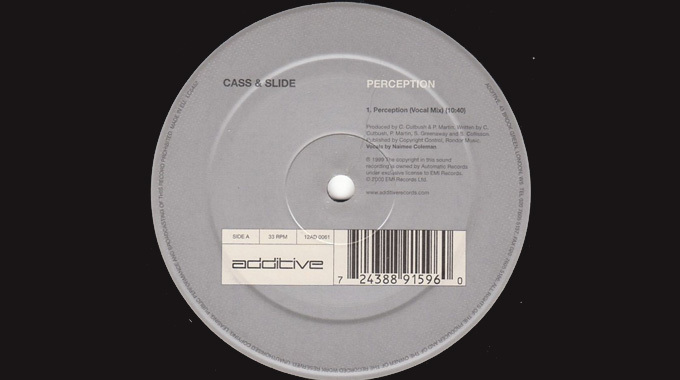 The next track i´m gonna feature is Cass & Slide – Perception [New Vocal Mix] (buy on iTunes which came out in the end of 2000. I’ve got an amazing story around how I first heard the track. It all started sometime in the beginning of 2000 when a friend of mine posted a sample of the track with only the vocal part which he heard in some DJ-set back then. I was a member of several housemusic-forums and the sample was posted on one of them in a section called ”Name that tune”. I was usually really good at naming tracks regarding all types of housemusic but this was a track I’ve never heard of before. I downloaded the sample and listened to it from time to time and even googled it (or whatever you used to use back then) with no result. I think it was perhaps 1,5-2 years later that I found out what it was called. Until then I’d probably listened to the sample I had more than 100 times. 5:47 into the song when the 2:nd verse comes in, also notice the main synth in the background fading up. First time I heard the whole song was really amazed by the lyrics and the progressive sound that build and builds until the vocals start around 5 minutes into the song when everything starts to build once again. I havent had the opportunity to hear anyone play it at any club but Markus Schulz (Buy on iTunes) did a remake of the song 2010. I first heard his version in march 2010 when he played at the Mondaybar Spring Cruise. Back then he only had a non-vocal version but later that year he had Justine Suissa sing the new vocals for the track. IMHO, Justine Suissa’s vocals is pretty flat compared to the original vocals by Naimee Coleman which has more feeling to them. Don’t get me wrong, I love Justine Suissas voice but in this case i’d go for the original any day of the week. Worth noticing is that Naimee Coleman did the vocals on Aurora’s big hit, Ordinary World (Buy on iTunes), which was a cover of one of Duran Durans biggest hits. Aurora later did another cover on Tasmin Archer’s big hit, Sleeping Satellite. Besides singing on these tracks, she’s had an impressive Solo-career, opening gigs for bands and artists like Van Morrison, Susanne Vega, Jackson Browne, 10,000 Maniacs, Sinead O’Connor and Sting. Cass & Slide are Cass Cutbush and Pete Martin and they first teamed up back in 1999 when they both worked on a recordlabel called Flying Rhino Records in London. Their first release, Diablo was released on the label. Cass later started his own recordlabel with fellow DJ, Lee Burridge, called Fire records where most of the Cass & Slide-material later was released. The track, Perception was an instant hit when world-famous DJ Sasha featured it on his compilation, Global Underground 013: Ibiza. Tiesto also featured it on his In Search Of Sunrise 2-compliation, which came out in 2000. After releasing their full-lenght album, Burning The Candle At Both Ends, in 2002 there has been pretty quiet from Cass & Slide, especially after Cass’s label, Fire, went under in 2003. I saw some remixes by Slide in the mid of 2000 but none of them did any big impression on me. I hope that you also find this track as good as I do so the spirit of Cass & Slide will live on forever. Markus Schulz feat Justine Suissa – Perception (YouTube). Aurora feat Naimee Coleman – Ordinary World (Above & Beyond Remix) (YouTube).